I am on a huge pizza kick lately! Ever since I started making my own pizza dough, it seems like we have homemade pizza for dinner about once a week. I love knowing exactly what goes into the pizza, and it’s really not much more work than ordering!!! I’ll post a tutorial on making your own pizza dough soon, but for now substitute any pizza like dough or crust you’d like! John even likes this pizza, despite the fact that it has a lot of vegetables! 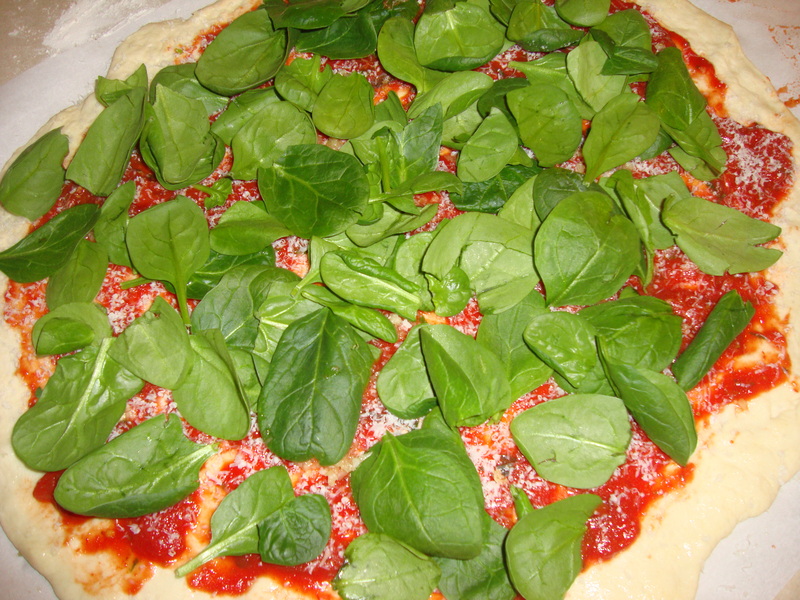 The recipe for the sauce calls for fresh basil, which can be hard to find and really expensive. Thanks to Monnette’s Market, I was able to buy a bunch of it for several recipes this week, right here in cold, wintery Toledo. A little hint with fresh basil is to roll up several leaves into a “cigar” shape, and then thinly slice them. This is how they get the basil to look so fresh and not wilted in restaurants. But if you can’t find fresh basil, substituting dried would probably be okay. Also the sauce recipe makes enough for 2 pizzas – but it freezes well. I usually make one pizza and freeze the other half of the sauce for pizza another week. Combine all ingredients in a bowl and stir with a wisk. Preheat the oven to 500 degrees. If you have a pizza stone (which is an awesome investment because it makes the pizza crisp on the bottom), preheat it as well in the oven. Roll your choice of pizza dough into a circle or square. Lightly brush the outer crust with olive oil. Evenly spread the pizza sauce over the pizza, leaving a thin border for the crust. Top with the Parmesan cheese, garlic, and spinach leaves. 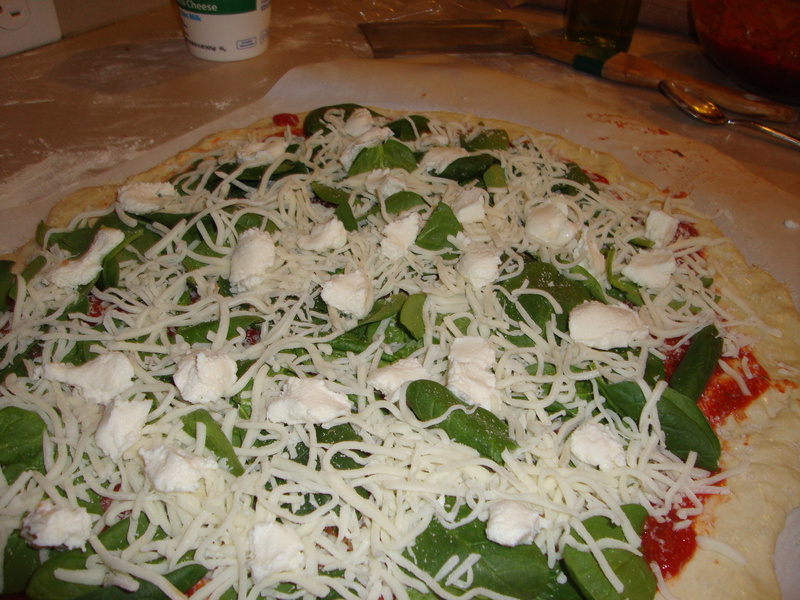 Then sprinkle mozzarella over the spinach, and top with small spoonfuls of Ricotta. Bake in the oven for 10-13 minutes or until the crust looks golden brown. 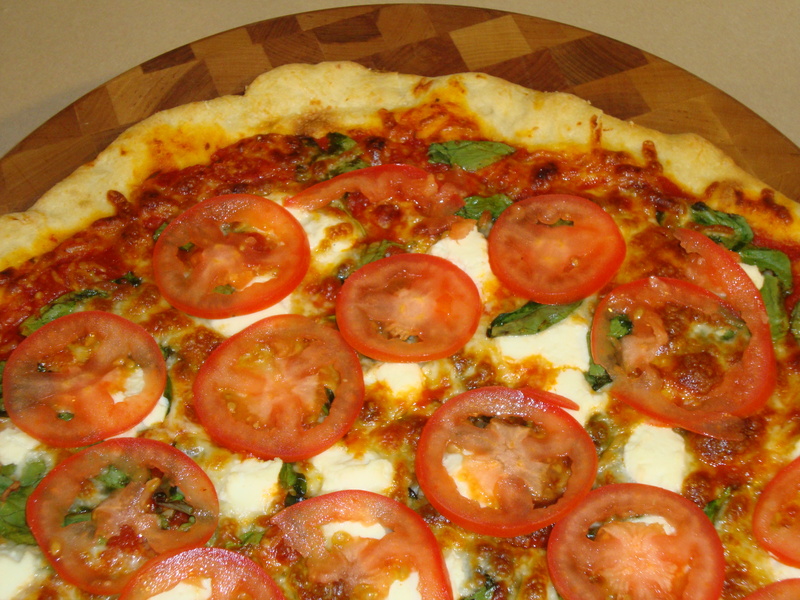 Carefully remove from oven and top immediately with sliced tomatos. This entry was posted on February 1, 2011 by Spice Is Nice. It was filed under Main Dish, Vegetarian . this pizza looks great, and I guess it was also very tasty! jacqueline you have NO idea how obsessed i am with new york-style pizza! i can’t wait to try this!!! You are so talented. You are an inspiration! Pizza looks incredible.